On or about this date in 1664, a Danish teenager named Elsje Christiaens was strangled at Amsterdam for murder. The date is a little shaky; I don’t know if it’s directly documented (the verdict, we know, came down on May 1). Whenever the execution took place was, it culminated an extremely short stay in Amsterdam for the young woman. This was boom time for the Dutch Republic, the last apex years before it all went to hell. Naturally, wealthy Amsterdam drew immigrants: for a penniless Jutland 18-year-old like Elsje Christiaens (English Wikipedia entry | Dutch), here was opportunity. In mid-April 1664, she took a room to lay her head while she looked for domestic employment. Two weeks later, she still hadn’t found a job but her landlady expected rent. When she came to demand it and Christiaens tried to stall her, the confrontation turned tragic: the landlady started thwacking her shiftless boarder with a broomstick, and Christiaens defensively grabbed a nearby hand-axe and knocked the poor woman down a flight of steps — to her death. Of course that happened long ago. 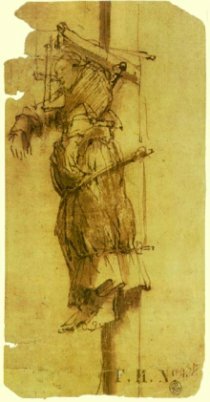 But at this time, veteran corpse–painter and Dutch Golden Age master Rembrandt van Rijn was hanging out in Amsterdam, living in reduced circumstances after creditors dunned him into the poorhouse. 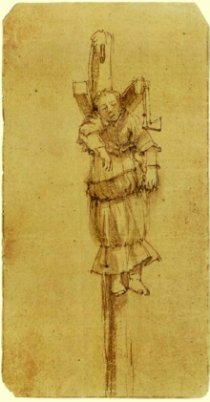 This was the first woman executed in 21 years, and Rembrandt did not mean to miss his opportunity to sketch it. On May 3, presumably the same day as Elsje Christiaen’s execution, he hired a boat to row him out to the Volewijck moor where the body had been hung up. That day the master sketched the immigrant girl’s freshly-executed corpse, and its shameful axe. The novelist Margriet de Moor has dramatized the sketchy backstory of Elsje Christiaens and her chance intersection with one of the art world’s greatest names in De schilder en het meisje. Unfortunately for most, this book appears to be available only in Dutch, which is also the language of these reviews: 1, 2, 3. 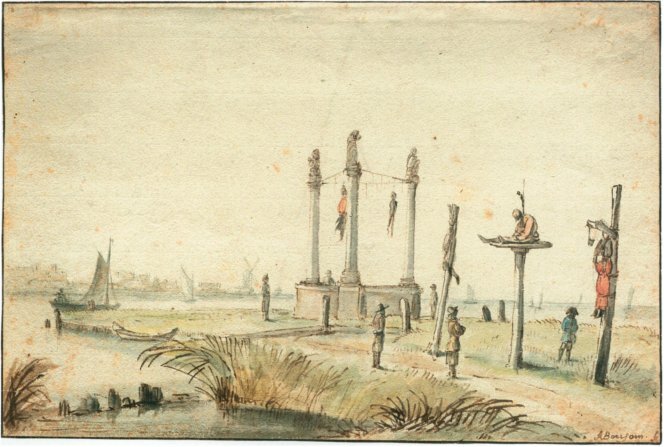 Rembrandt wasn’t the only Dutch painter haunting Amsterdam’s execution-grounds in 1664. Anthonie van Borssom‘s 1664 ink-and-watercolor painting of the Volewijck execution site. The gallows stood at the Volewijck until 1795. Today, that once-hard-to-reach peninsula is a residential district in Amsterdam-Noord. * “Rembrandt and His Circle: Drawings and Prints,” The Metropolitan Museum of Art Bulletin, Summer 2006. 1700: The Rev. Thomas Hunter, M.A.